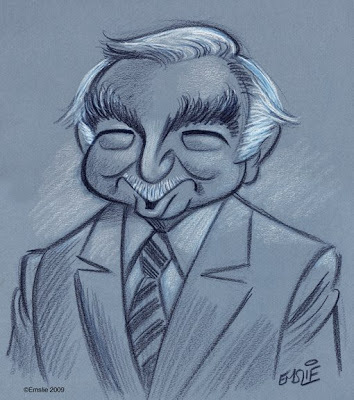 The Cartoon Cave: Walter Cronkite Signs Off For The Last Time. Though he lived a long and full life, passing away at the ripe old age of 92, Walter Cronkite will be well missed. I was too young at the time to have witnessed the pivotal moments in America's history that he famously covered, such as the assassinations of President Kennedy and Martin Luther King, or the first walk on the moon by Neil Armstrong. But for a teenager growing up in the 1970s, Walter Cronkite was a familiar and comforting presence on the evening news, speaking in that calmly reassuring voice of quiet authority. In fact, with his bushy eyebrows, neatly trimmed mustache, and warm midwestern tones, he very much put me in mind of that other Walter - the one who went by the name, Walt Disney. Like Disney, Walter Cronkite came across to we youngsters as a trusted older uncle or grandfather type. It's no wonder that he had earned the nickname, "The Most Trusted Man in America", as he always seemed to be giving us the straight goods, devoid of the type of hype we're fed today, especially on the all-news channels. I suspect that I wasn't the only one who had noticed his similarity to Walt Disney, as there seemed to be a distinct Disney connection for Cronkite in his later years. On October 1st 1982, my family and I were at Walt Disney World for the opening day of EPCOT Center, and it was very exciting to be among the first guests to experience this new park. Of course, we wanted to do things right, and immediately joined the big line-up just inside the park entrance for the attraction within EPCOT's iconic geosphere, Spaceship Earth. This attraction was sponsored by Bell, and simulated a time machine trip through the history of communication. As guests who visited Spaceship Earth in the early years will recall, the narrator of this trip through time was none other than Walter Cronkite. Again, I couldn't help but think of Walt Disney's voice back when he hosted his TV show, as I listened to the warm, rumbly midwestern tones of Mr. Cronkite. Micheal Savage is going rip him a new one on Monday. he will be missed. I didn't grow up with him, but I knew of him. I always liked his sign off: "And that's the way it is". It's up there with Edward R. Murrow's "Good Night and Good Luck"
Your caricatures are always brilliant. It's Hershfeld meets Disney.Very inspirational and a joy to look at as is all your work.